ENGINEERING. PRACTICE. POLICY. 51 February/March 2018 unmanned systems inside which has sparked even more interest in UAS in the nuclear community. "We've been inundated with calls," Aubrey said, noting it was the first time they've used a drone in the Cook facility. "I know we are going to identify every opportunity we can to incorporate the technol- ogy. It's safer, it's less expensive and the final product is very good. The only real challenge was convincing folks this new technology is capable to do what we need and to do it safely. There's a whole site full of believers here now because they've seen it." Other nuclear facilities are adopting drones for a variety of uses both indoors and outdoors, including inspections and mapping. 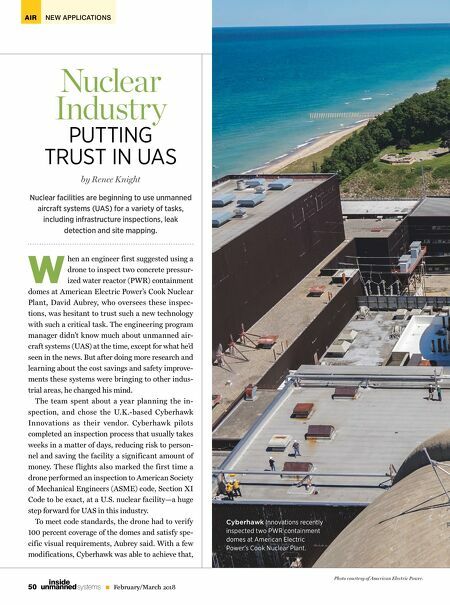 John Lindberg, program manager in the Electric Power Research Institute's (EPR I) Nuclear Non-Destr uctive Evaluation Innovation Program, sees drones becoming a common tool in nuclear facilities in the next three to five years, with EPRI being part of the push to make that happen. The Cook Plant Inspection The containment structures that needed inspecting are about 150 feet tall and 110 feet in diameter, which means a large crane must be brought in to lift per- sonnel 180 feet in the air so they can get close enough to see any f laws, Aubrey said. It takes a week to set up the crane and a week to take it down, which is not only an expensive process, it's also a safety issue. Workers have to build a large crane in an industrial area, with the high voltage tension lines coming off the plant in close proximity. The inspection, which must be completed every five years, is also weather dependent, Aubrey said. If it's too windy, they can't use the crane, and that means they're disrupting normal facility operations even longer. Once Aubrey and his team decided to deploy a drone for their next inspection, they went to work to find a company that could operate in this environ- ment and provide them with the detailed informa- tion they needed. Cyberhawk was given the safety code require- ments, which were very specific as far as what had to be seen and what had to be measured, said Malcolm Connolly, Cyberhawk founder and technical direc- tor. From there, they had to come up with a plan to I KNOW WE ARE GOING TO IDENTIFY EVERY OPPORTUNITY WE CAN TO INCORPORATE THE TECHNOLOGY. IT'S SAFER, IT'S LESS EXPENSIVE AND THE FINAL PRODUCT IS VERY GOOD." 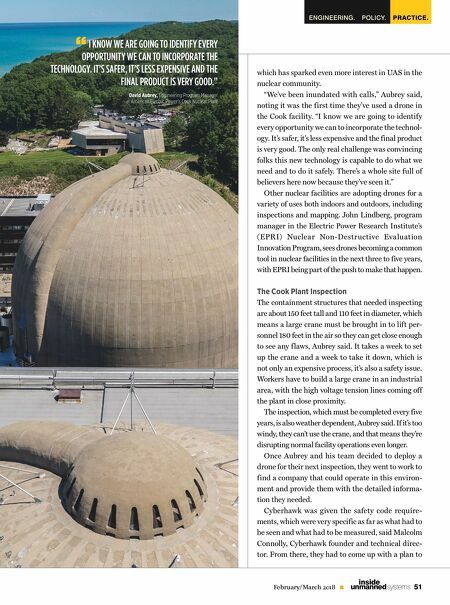 David Aubrey, Engineering Program Manager at American Electric Power's Cook Nuclear Plant "